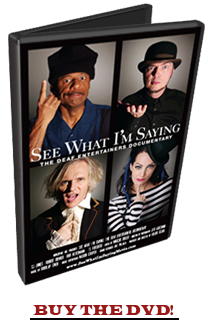 I am so very happy to announce some sneak preview screenings of SEE WHAT I'M SAYING at the Philadelphia Film Festival at the end of March and a screening at the Rochester Deaf Film Festival. You will have a chance to see our work in progress gearing up to a world premiere of the film later this year. I am waiting on details from all of these screenings such as exact dates and locations to add to our website and send out in our newsletter announcement. I am very excited about all of this news and will post details the moment I get them. I have taken a little much-needed time out for Thanksgiving this week and am visiting my sister and brother-in-law in Atlanta. It's an exciting time for them, expecting their first child in April, and fun for me to see my sister pregnant. As much as I am enjoying being with my family, I know that Sundance, which is held every January in Utah, is going to start announcing their lineup any day. I know that the film is going to find its way into the world premiere that is right for us, and Sundance may not be that place. Not only is it expensive and one of the most competitive festivals in the world, but there are threats of Sundance being boycotted by Hollywood this year over Utah's support of passing Prop 8. I doubt that will happen, but I do support gay rights include the right to marry. So I am trying to quell Sundance fever as it is sometimes called, and staving off potential disappointment from so many supporters who have been involved in this film. I have submitted the film to 15 festivals around the world, and know that we will play in front of many wonderful audiences. Every project has their inevitable ups and downs, and I am reminded of stories of films that get into Sundance, get ignored by distributors and the filmmakers leave the festival dejected and broke. Others were rejected by Sundance and ultimately ended up with a theatrical run. Perhaps I am just preparing for sour grapes and the disappointment of not being one of the 16 films selected out of 1,500 documentaries submitted, but here is a quote from "South Park" creators Matt Stone and Trey Parker. "Sundance is the ultimate gimmick," says Parker, "there is nothing independent or artistic about it and it's ridiculous." So this Thanksgiving I toast to independent filmmaking and getting an important message out about the talents of these entertainers that I will continue to shout and sign from the rooftops. I am finally getting caught up with everything that has been postponed during production. We had an incredible fundraiser in June to raise finishing funds for the documentary. My rockin' friends Ninette and Phil opened up their home and their backyard to host Vizual, our Cirque du Soleil style fundraiser complete with aerial acts by Ninette and her Silk Sisters Buffy and Emily. The event was hosted by Gary Anthony Williams and CJ Jones, with entertainment from Kathy Buckley, Dan Thurmon, aerialist Lexi Pearl and contortionist Jacqui. Sheena McFeely was our incredible event planner who organized a team of volunteers and helpers. Thank you to everyone who came and made the evening a success. We were able to raise enough funds to finish the film - yahoo! After I sent out the last newsletter, I received several emails from other entertainers asking if they were still in the film because they weren't mentioned by name in the newsletter. The answer is YES! It was very important to me to include as many entertainers as possible, for many reasons. First, I believe that I could have done a full documentary on any one of dozens of these talented performers, as they all have interesting and unique stories. Second, I am extremely aware of the limited opportunities these entertainers have in getting their work seen, which they so richly deserve. There are many cameos throughout the film when I was lucky enough to cross paths with such incredible performers such as Deanne Bray, Troy Kotsur, Michelle Banks, Fred Beam, Kathy Buckley, Rita Corey, John Maucere, Warren "Wawa" Snipes, Vae, SPO, Nat Wilson, Russell Harvard, Lisa Hermatz, Bernard Bragg, Adrian Blue, Ed Chevy, Steve Longo, Sheena McFeely, Megg Rose, Garrett Zuercher... the list goes on and on. I am so proud and honored to include so many people who have inspired me and influenced so many others. 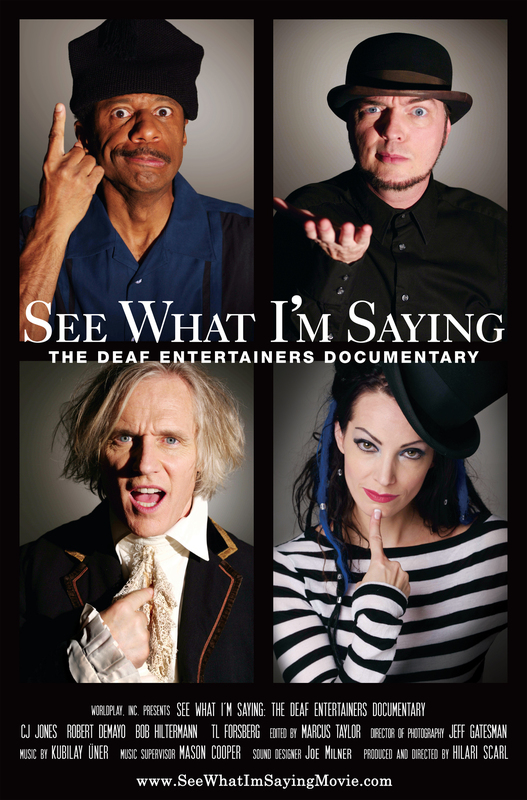 Please feel free to add comments to this blog about your favorite deaf entertainer and links to their websites. I am happy to read news about upcoming performances or stories about their work. Who knows? We might even be able to feature you on the website when we come to your town with the film!